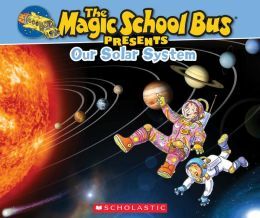 Finally, Scholastic is helping to clear up the debate about the validity of calling the “Magic School Bus” books nonfiction. For so many children and adults, the magic ability of the school bus to change size and function caused confusion about whether or not the information in the book was true. Here scholastic has come out with a paperback set of nonfiction companions to the popular series. This is one of many of their new nonfiction companion books. The use of photographs from NASA and others, makes this a truly believable set. There are occasional throwbacks to the original series with Frizzle Facts and some questions and answers on the familiar yellow notebook paper, but none of that distracts from the science validity. Purists might still quiver at the interjected comic graphics of Arnold and his pals as well as the sketches of Liz the lizard in her space ship. However, this set of books is much more likely to be used to support the common core standards than the previous ones. In teaching literacy skills, there are the requirements for nonfiction writing, such as: the use of real dates, proper names of explorers and space crafts, and actual photographs. The text of the book is nonfiction. While that will be explainable to the second and third grade readers, for preschoolers, kindergarteners and first graders the discrepancy between the truth of the text and the fiction of the illustrations will continue to cause confusion. Therefore, it could be a valuable book for teaching and sorting out the differences between fact and fiction. Librarians and parents can use these books to engage reluctant readers into the realm of science, but then should move rapidly into solely nonfiction texts.